Our Trailblazer Backpack is one serious bag for student, commuter, or outdoorsman. A massive main compartment will accommodate large loads. 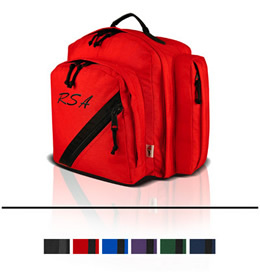 Two zippered side pockets provide additional easy to access storage. A large front pocket contains an organizer to keep accessories and supplies in order. An additional zippered corner pocket provides a convenient space for coins and keys. The Trailblazer comes with a full-leather bottom for added durability. A leather-padded top handle is center balanced for handling ease. The back of the pack is fully padded for additional comfort.